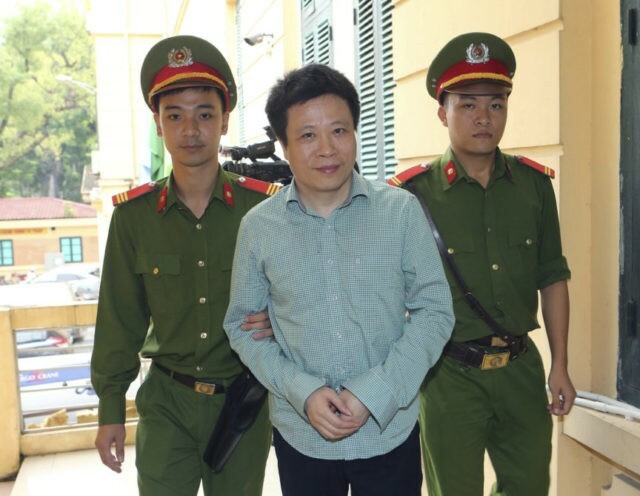 HANOI, Vietnam (AP) — The former head of state-owned PetroVietnam was sentenced to death Friday for embezzlement and abuse of power committed in his former job leading a bank partly owned by Vietnam’s oil-and-gas giant. A judge in the graft case involving dozens of defendants warned that corruption by Communist Party members and civil servants threatened the regime’s survival. Nguyen Xuan Son was convicted by the Hanoi People’s Court of embezzling $2.15 million and abusing his power to appropriate another $8.7 million from Ocean Bank, a joint stock bank in which PetroVietnam had owned 20 percent of shares. Ocean Bank chairman Ha Van Tham was given a term of life imprisonment for convictions on the same charges at the end of the monthlong trial involving 51 defendants, most of them Ocean Bank executives. “The acts of Nguyen Xuan Son and Ha Van Tham are particularly serious, infringing on the rights of property of the state and organization causing anger and dissonant among the people that needs to be handled seriously … in the fight against crimes in general and corruption in particular in the current time,” said Truong Viet Toan, one of the two judges in announcing the verdict that lasted nearly three hours. Toan said corruption degraded a number of Communist Party members and civil servants who stole the people’s trust in the ruling Communist Party and state and threatened to survival of the regime. Twelve defendants received sentences of up to 30 years. Thirty-two received suspended sentences of up to 3 years while the remaining five were sentenced to undergo 2 years of re-education. Ocean Bank was taken over by the State Bank in 2015 at no cost after reported accumulated losses of $445 million. PetroVietnam lost all its investment after the takeover. Son was the bank’s general director before being promoted to become chairman of the board of PetroVietnam in 2014. Son and Tham were accused of initiating a policy of giving interests exceeding the rate set by the central bank to more than 50,000 individuals and nearly 400 companies and institutions that resulted in the losses of $69 million to the bank. Ocean Bank executives told the court they had to offer customers higher interest rates to attract savings and that the bank would have collapsed if they had not done so. Over the past month, police in widening their investigation into the case have arrested or put under house four other former or current senior executives of PetroVietnam and a former deputy State Bank governor who oversaw bad debts at credit institutions. Three PetroVietnam subsidiaries were also being investigated for alleged abuse of power in appropriating $5.3 million, police said earlier this month. The police statement said $3.4 million of the excessive interest was given to PetroVietnam Exploration and Production Corp., $852,000 was given to Binh Son Oil Refinery Co. and $1 million was given to VietsovPetro, a joint venture between PetroVietnam and Russia. Vietnam ranks 113 out of 176 countries in Transparency International’s 2016 corruption index.